We have all noticed, the similarities of mechanisms that generate waves at the Wave Garden project, patented by a Spanish firm established in the Basque Country, as well as Kelly Slater's latest project, Kelly Slater Wave Co. This last one, lately, has been capturing all the media attention. Although the Kelly Slater Wave Co. wave is much larger and more tubular than its competitor and original technology that uses a hydrofoil, a mechanical device driven by electric power that slides in the center of a pond / pool and during its movement moves the water and creates a wave throughout its length. This curl curves in the pool / lagoon side benches, producing two perfect waves that break in the direction of the mechanism, simultaneously to the left and right. 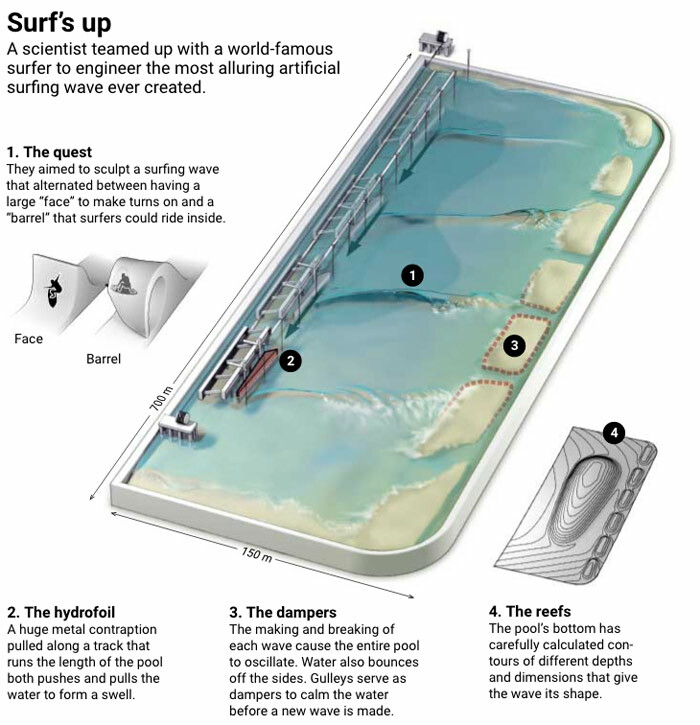 The technology that began to be developed by Kelly Slater in 2005 and ended up being shown to the world during the year 2015, presents nothing less than the same principle of Wavegarden, being its mechanism bigger, more powerful and producing bigger and tubular waves in all it’s extension. Wavegarden project was conceived worldwide, to give an oportunity to all those that wish to try surfing any where on earth, while allowing economic viability to each Wavegarden installed. By other words the equation that contemplates a certain number of waves produced in a certain space of time with the adequate energy expenditure in a certain physical space that allows the use of a certain number of people, will allow its economic viability. And Wavegarden already has evidence on this, having already completed several projects worldwide and others under a construction phase. KS Wave Co has now begun its diffusion,(according to Beach Grift) with the first pool to be "commissioned" by the 11x world champion hometown - Palm Beach, Florida. If the Basque company has been quietly following the steps of KS Wave Co, the scenario may change if Kelly Slater Company take the next step, the commercialization of its technology worldwide. Will we assist to a patent war or will we eventually assist a fusion? This next weeks or months will be very interesting to follow. In one side, we have an original and patented technology from Wavegarden with great recognition and notoriety worldwide. 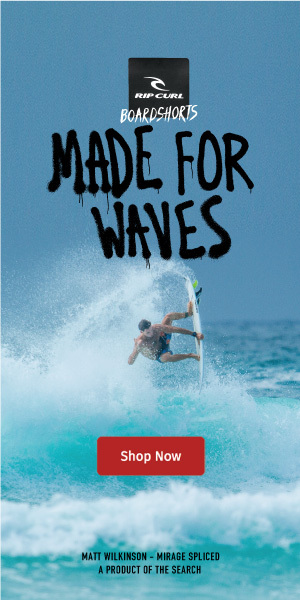 On the other hand, we have a similar technology that claims to be the "new Hydro Foil" and produces larger tubular waves, and even more important, it belongs to Kelly Slater and will host a WSL World Championship Tour event event in 2018. whether its economic viability is a reallity and whether it really wants to expand it commercially worldwide. 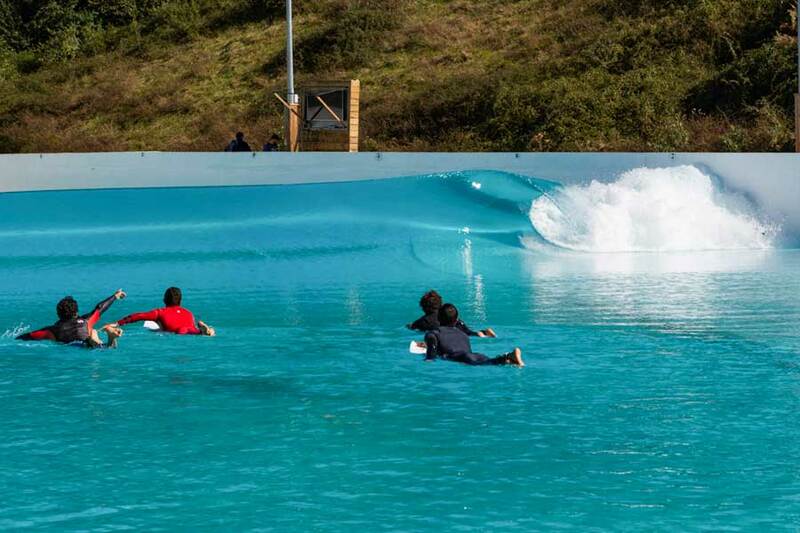 Wavegarden was born in 2004 when some surfers and engineers from the Basque Country came together and decided to research more about artificial waves. Like all pioneers, for a long time they have researched, developed ideas, and implemented various concepts in a timely manner. At that time there was practically nothing about a technology that was capable of generating waves, so its implementation had to be done from scratch, that is, from the design, design and even the construction of its own facilities. In May of last year the Cove was revealed, the next phase of Wavegarden technology capable of reproducing up to 1000 waves per hour. Being much more energy efficient, it breaks up, definitively, with the previous models and raises the game to a new level. In 2015 we saw surfing at night become a very palpable and absolutely incredible reality, but we also had the opportunity to finally see the inauguration of the first public complex equipped with Basque technology 11 years after the first stone was laid. Surfing Snowdonia, Wales, opened doors and was a success. The second large public park opened last year in Austin, Texas. It's called NLand Surf Park and also enjoyed the endorsement of several professional North American surfers. Currently, Wavegarden also has projects underway in Barcelona, Madrid, Costa del Sol, Edinburgh, Bristol, London, Melbourne, Sydney, Perth, New York, Miami, Santiago, Marrakesh and Tel Aviv. 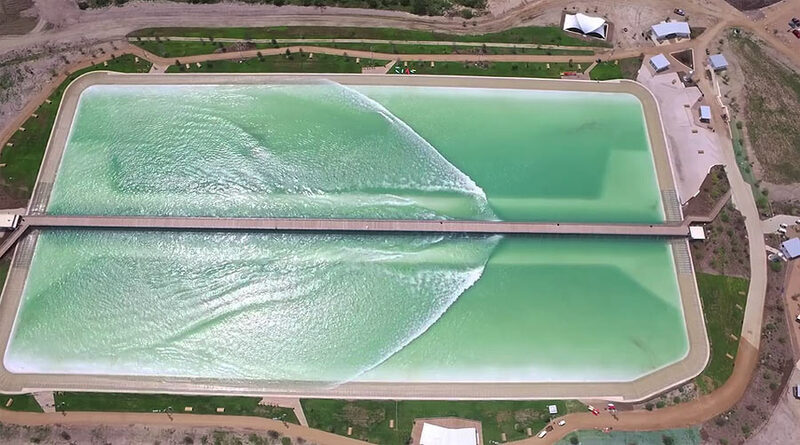 Kelly Slater worked for years to achieve one of her child's dreams: having a wave pool with waves seriously. For a decade, as the story goes, the 11x world surfing champion worked with a team of engineers to reveal to us at the end of 2015 the KS Wave Co. In fact Kelly had the idea, but for the development. In fact Kelly had the idea but to develop it, he had to join Adam Fincham, professor of research and specialist in fluid mechanics at the University of Southern California. Since 2006 the two have been working together, having developed the concept to this day - a hydrofoil (a shovel) that is partially submerged in water. When crossing the pool, this hydrofoil moves the water to the side that then returns to the initially generated wave to join the moving water. The result is what physicists call a solitary wave that mimics an individual ripple in the open ocean. (KS Wave Co is powered by solar energy). Read more about KS Wave Co here. Both Wavegarden and KS Wave Co. seem to have something in common: Keeping alive the dream of being able to surf anywhere on the planet, anytime!